Since I was a little girl I always wanted to work in aviation and aerospace. I wanted to be a fighter pilot, aerospace engineer and astronaut, I didn’t get to fully pursue my dream. I instead went the route of corporate business working in management roles within some of the biggest companies in the world, where I excelled. I have over 20 years of senior level management experience in sales management, strategic planning, national product and customer marketing, innovation, large team management, emerging tech ventures, corporate innovation, IP commercialization, startup development, and business development with global companies on projects in Asia, Europe, and South America. I have worked for companies such as P&G, Coca-Cola, and with major labels and studios in the entertainment industry, as well as, Silicon Valley based tech companies. I’m also a former Associate Director of Georgia State University’s Entrepreneurship & Innovation Institute. When I found the world of drones, it ignited a fire and here I am, a drone pilot, and founder of drone solution companies. I saw the mix of my love for aviation, aerospace, technology and startup management. 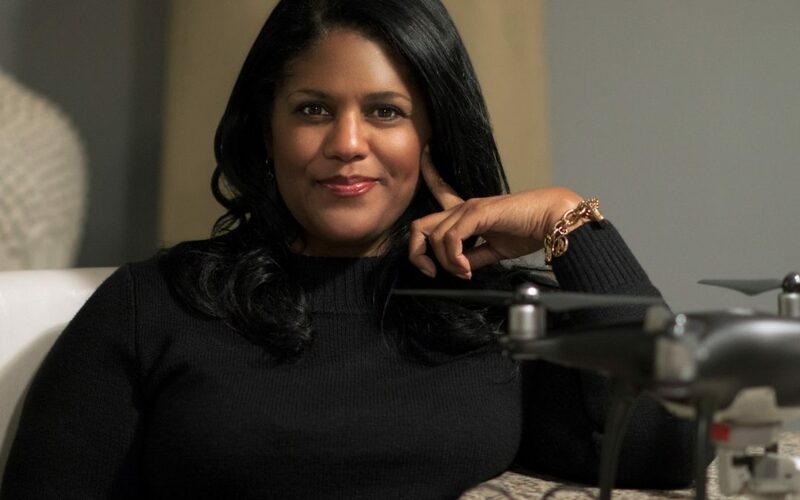 I am a frequent guest panelist and speaker for Women In Technology on many subjects specifically UAVs. 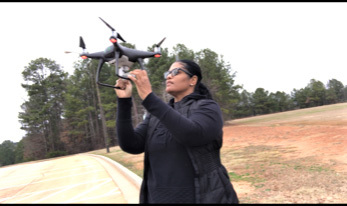 I was one of few women leaders moderating at the inaugural Georgia Drone Summit. I manage three organizations in the drone industry, Wings Drones Consulting, Xeo Air and Airversity Drone Pilot Academy. Wings Drone Consulting is here to aid organizations who are seeking to set up drone operations in better developing a process, business model and use case for the implementation of drones. Xeo Air is a drones as a service (Daas) web/mobile application that allows for custom mission creation, mission management, data analytics and mission accuracy for B2B clients. We create a seamless and easy web and mobile user experience and interface to aid organizations in need of aerial services. We provide a network of vetted, experienced, and insured contracted Part 107 pilots, with various equipment types, to meet requirements for above ground, below ground, LIDAR, FLIR and other data formats. We focus on industries such as construction, insurance, disaster, civil infrastructure, real estate, telecom, oil and gas and rail. Airversity Drone Pilot Academy is a prep course lead by live instructors for the Part 107 exam. In addition to ground school, we also offer flight training to ensure we’re delivering prepared and capable drone professionals taking to the sky. I’m enjoying being on the cutting edge of the future. The UAV industry thus far is pretty wide open in terms of opportunity and innovation. Collaborating with my peers on how we should approach problem solving is intriguing. Being in a new sector means that almost everyone is starting on the same page, we get to participate in the evolution of an industry. Being a pioneer and charting new territory is catalyst for me. My goal is to solve problems for customers and to create jobs with new skills to prepare people for the workforce of the future. Xeo Air offers me and my team a chance to help our clients save time, money, protect their human assets and make decisions quickly. I particularly like complex missions such as disaster response where we have to overcome many obstacles such as loss of power, restricted access, and precarious flight windows to get the job done. When inspecting sites under significant duress we know that we must do what it takes to get the job done. Being able to utilize our professional skills, dedicated teamwork, relentless duty and creativity to get critical information for those in need provides high job satisfaction. Knowing that our drones can do what other equipment can’t, provides for a great deal of pride and commitment. Our data can mean the difference in life and death. We were flying missions during the hurricanes in the Southeastern USA last Fall, the situation was in an extreme emergency status. Our pilots were able to get into spaces that others weren’t; with support from local law enforcement, and our pure commitment we were able to achieve our objectives despite power black outs, long days, hard to reach sites and lack of internet access. We were able to work with military installations to get support to fly in restricted areas and worked directly with our aviation administration to ensure we were compliant with the flight rules which changed in real time. Additionally, we risked being victims of crime, almost running out gas, running into deep flood waters, all to provide our client round the clock updates and the data they needed when they needed it to make decisions that meant life and death to those impacted. We went above and beyond and that’s how we always operate; safe, professional and able to get what the client needs when they need it. My favorite is my trusty Phantom 4 Pro – get the job done. I call her Dronie! My lightbulb moment has been primarily around how much opportunity exists but how little those outside of the industry understand how we are lead by both aviation and innovation. The vision of where we go will have to be tempered with public perception, aviation safety and equipment capabilities. We will grow as we solve problems that make it safe for us and those around us. This intrigues me and forces me to seek new ways to solve problems for the industry. We are early in our development and that means a great deal of innovation, collaboration and responsibility. What have you learned you wish you had known when you started in the industry? There is a huge learning curve for those of in the industry and opportunity to educate those we serve. The understanding of what we do is still a bit mysterious to the public and to our client base. This isn’t a path to riches industry, you must want to be on the ground floor because you love it and have a passion for it. I knew that, but now I see just how early stage almost all segments and suppliers are in this industry. I find it exciting and at times daunting. Some days there is no one to call who has the perfect answer, or I find my inquiry goes unanswered because my question doesn’t yet have a solution. Persistently we move forward with improved software, hardware and more skilled industry professionals. We grow together. Is there a tip you learned you would to share with other women in the industry? Don’t be afraid to jump in, start at the ground level and work your way up. With this being a young and growing industry your ideas, vision and commitment are as valuable as any others. Find your community of industry supporters, mentors and advisers and get to work. There is a great deal of room for new people and new solutions. I’m here to serve as a supporter and ally to anyone in the industry. I look forwrad to joining with you as you enter.